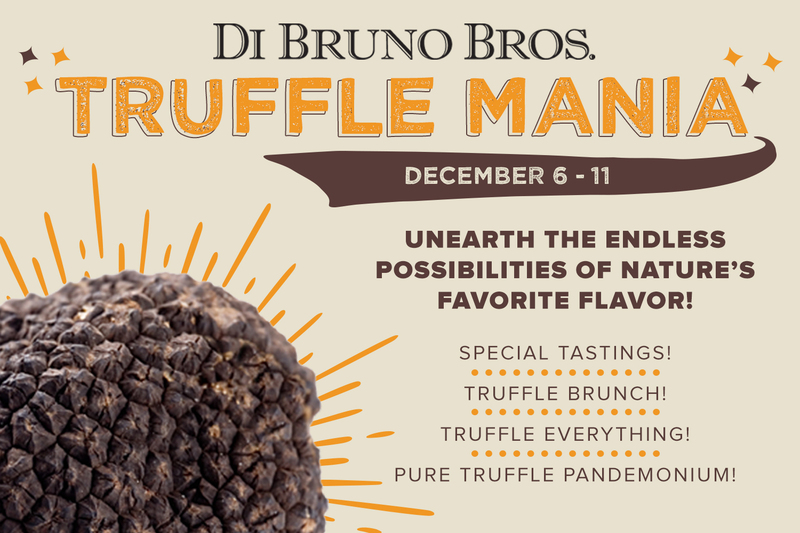 How To Cook With Truffle | Blog | Di Bruno Bros. In honor of Truffle Mania – being celebrated at all Di Bruno Bros. locations from December 6-11th – and the fact that we’re right in the height of truffle season, here’s a chance to brush up on the basics about this funky little fungus that demands a pretty high price tag and adds an unrivaled pizzazz to any dish that it meets. Learn more about Truffle Mania by clicking here, check out Truffle 101 by clicking here, or read a recap about the purchase of our Alba truffle by clicking here. Truffle for Breakfast! Eggs and truffles, truffled avocado toast, and beyond. Waking up with your favorite funghi. Which of your favorite breakfast foods do you generally finish off with a sprinkling of salt? Eggs, avocado toast, grits…the list goes on. Truffle for Lunch! Salad dressing with a truffley spin. Does your standard salad feel a little boring from time to time? Try adding truffle oil to your vinaigrette to wake those midday taste buds right up. The classic vinaigrette ratio of 3 to 1, oil to vinegar is kind of a helpful guideline, but we’d still suggest starting light on the truffle addition. Do 2 tablespoons of truffle oil to every ½ cup of extra virgin olive oil, or feel free to up the ratio if you really love the truffley stuff. There are lots of factors—the salad ingredients, the acidity of the vinegar, and whether the dressing is emulsified with egg yolk or mustard—that will affect your overall vinaigrette flavor, as will adding things like shallots, dried chiles, or anchovies. In our experience, shallot and mustard make the best additions to a truffle-based vinaigrette, but feel encouraged to test out your own recipes! Heck, come back and leave them in the comments so we can test them out ourselves. Simple vegetables are also great tossed in a bit of truffle oil. It’s nothing groundbreaking or new, but simply a pleasant reminder to suggest that you blanch some good asparagus, toss it in truffle oil and lemon juice, grate some parm on top, and enjoy. Simple is sometimes the tastiest, even with truffle. Does anyone ever actually make it from lunch to dinner without a snack in between? (And who are these mythical people if so??) Truffle loves snacks. When it’s 3pm and you’re drooping, treat yourself to a few slivers of your favorite cheese and drizzle a hearty spoonful of white truffle honey on top. If you shut your eyes, it’ll feel like you’re on vacation in (insert your dream location here) and give your mind a few blissful moments of peace. Truffle-flavored peace; who knew? Perk up your pasta dinner with a) shavings of fresh truffle, if possible or b) at the very least, a finishing drizzle of truffle oil or a fun truffle salt. There’s even truffle zest available for—you guessed it—zesting, if straight salt isn’t your thing. These same dressings, from the real truffle to the flavoring accents, are also great when applied to a hearty cut of meat or even a sautéed piece of fish. Have you got a hearty hunk of filet mignon? Make it nice with some black or white truffle cream on top. We recommend white truffle cream for a fish or chicken, and black truffle cream for beef and bison. Never used truffle cream before? They’re delicious, with a smooth consistency that punches the palate. Truffle creams are pleasantly funky and easy to love. Use them where you’d usually use butter, such as topping a protein or whipped into mashed potatoes. 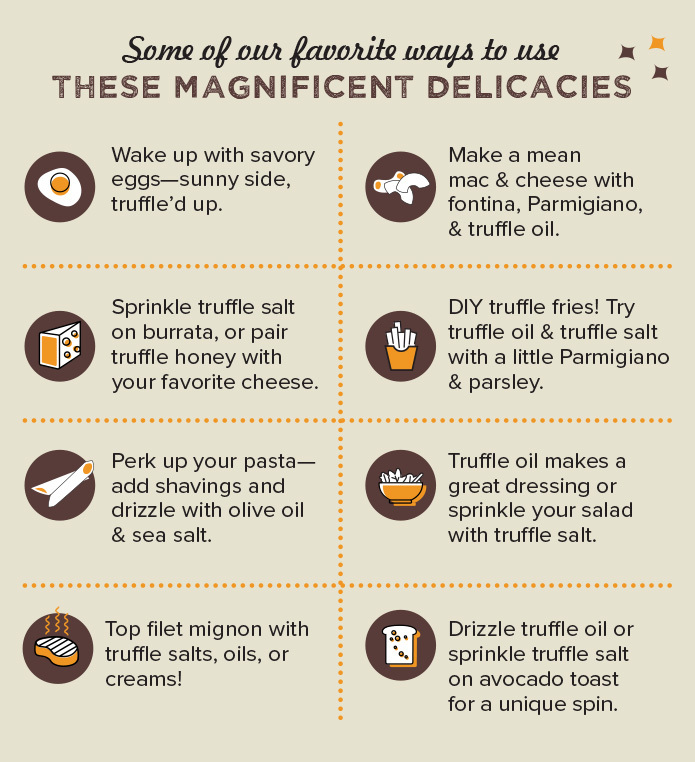 Have any other fun truffled-up ideas to add into the mix?! Send them our way in the comments!